I'm going to remain silent on this one. The Collins Brithers on Circo Massimo with yet another take on the Boxing Gag. 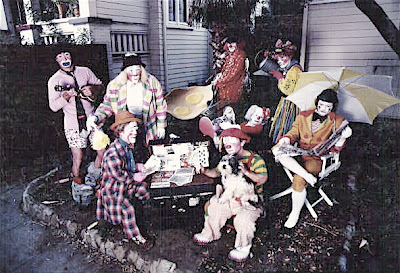 Bozo Row circa 1979 Hollywood, CA. Can you name the Row??? I see Billy Baker, Kevin Bickford, Robin Shaw, Dolly Baker, Jimmy Briscoe, Ed Smith, Daniel Rodgers and Mr. Ron Jarvis. 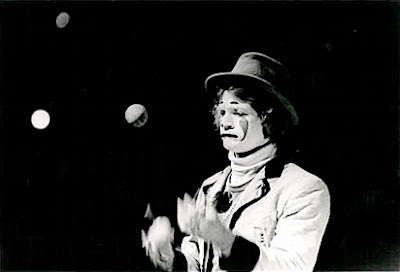 Eccentric genius Doug Ashton dancing in a production number during his first season with the Ringling Bros. and Barnum & Bailey Circus in 1967. Mr. Ashton doesn't seem to be dancing along with the music from the show quite as much as he's dancing to the music in his own head, so I've replaced the soundtrack with the song "Fidgety Feet" by the Firehouse Five plus Four and added the applause that I think he deserves for such a performance. He's doing everything a three ring circus clown SHOULD do during a production number! He's having fun, he's exciting to watch, he's playing with the showgirls on the track and keeping in the moment. Which, unfortunately, is everything that management frowns on. 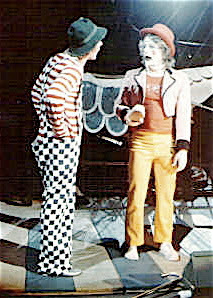 Look to the right of the screen for whiteface clown Dennis Stevens (performing the assigned dance steps while in drag) and to the left as Dougie is egged on by his longtime partner in crime Lazlo Donnert. DAN RICE: Happy 4th of July! Happy Independence Day to everybody here in America. As for everyone else? Happy Wednesday! Awakening from the Long Sleep of Life is a true story about clown Peter Shub who lost his five year old son in a tragic accident. He leaves us with a philosophy about life and loss and the message to celebrate and thank life rather than to mourn for death. 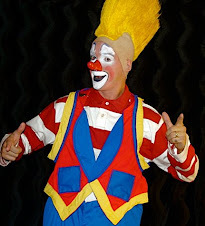 An extremely difficult piece of video for me to find, here is Mark "Mark Anthony" Galkowski's reinterpretation of the classic breakaway bicycle act performed in Venice, Fl in 1967 on the Ringling Bros. and Barnum & Bailey Circus. I remember him performing this again a few years later on the Blue Unit in the early 70s when I was very young but I haven't seen the act at all since then, until this video arrived last week. Small detail: notice that Mark is working here without a wig. 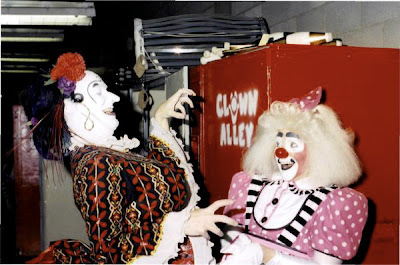 Jay Stewart and Lara Heidtman Smith goofing around outside The Alley on the Rinling Bros. and Barnum & Bailey Red Unit in 2000. 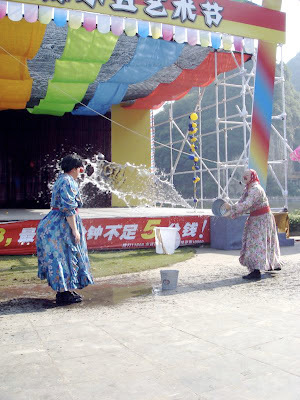 Mike Smith and Jay Stewart perform the classic Washer Woman Gag at the Happy Liuzhou International Clown Festival in Liuzhou, China in 2007. The Sunday New York Times travel section ran a story about Idaho yesterday entitled "The Last Wilderness" about what a beautiful and fascinating state Idaho is to vacation in. 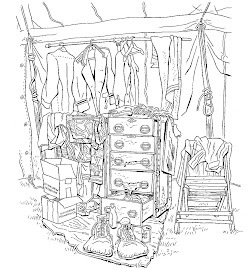 At the article's end the writer only mentions three resorts in the ENTIRE state, one of which is the THREE RIVERS RESORT IN KOOSKIA AT LOWELL, IDAHO, which is owned and operated by friends and former Ringling circus clowns Mike and Lara (Heidtman) Smith. Contratulations on the endorsement and hope to see you both when we go back to China in the fall! To find out more about the Three Rivers Resort, or to book a vacation, please click the title of this post. 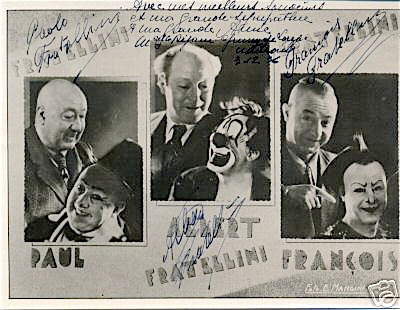 An autographed photo of The Fratellini Trio, (from left) Paul, Albert and Francois. I wonder why they changed Paulo to "Paul", Alberto to "Albert" but Francois never became "Frank"? Do you think it's a "whiteface" thing? "Frank Fratellini" doesn't have the same ring anyway. Sounds like a very blunt plate of pasta. "Frankie Fratellini" is even worse. It's probably better just he way it is. 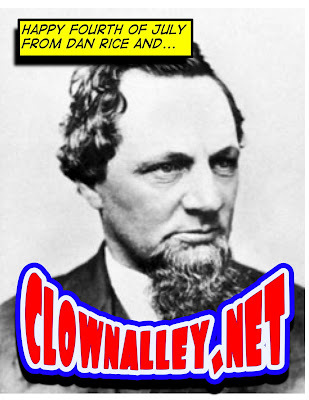 So the t-shirts and mugs (still available at the CLOWNALLEY.NET store, see the link on the right hand side of this page) have brought in some money but we're still far from having enough for any kind of marker. Several people have told me that they'd prefer to just donate money. So that's the next faze. 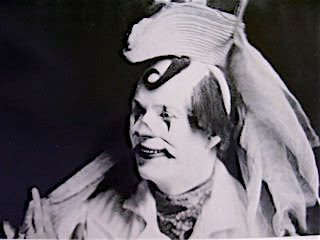 This week I will set up a PayPal account that will be completely dedicated to CLOWNALLEY.NET projects. Several people have asked if we have a deadline for donations? The answer is "kind of". I'd like to be able to install the marker by August 28, 2007. 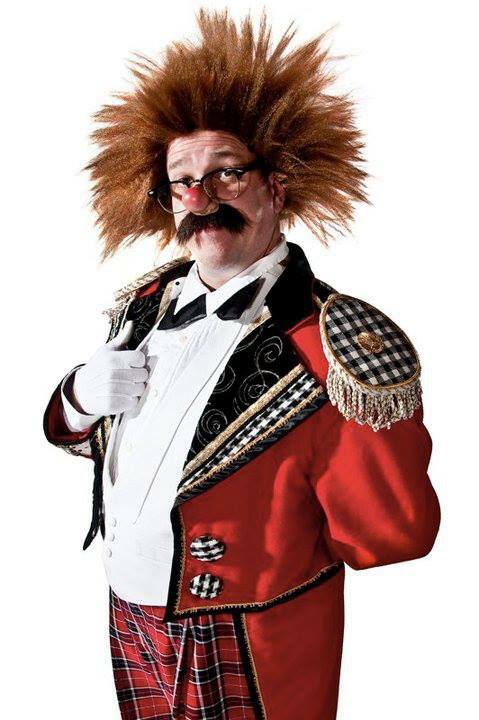 That will be my 40th birthday and will also mark (although not the exact date) 10 years since the closing of Ringling Bros. and Barnum & Bailey Clown College.